That particular road there is North St. And I’m pretty sure – without having a magnifying glass- that that particular road there is George St, where I was born. It’s September 23rd 1906 on the stamp – it’s about the turn of the last century. I can remember the old lamps that were there, and the chappie coming along at night with a stick on his bike. I can remember the Canadians being up and down there. And when we had VE Day they pulled all the gates down, and burnt them, and had massive bonfires in the street. It’s the start of my life in North. Buckler Street, Portslade runs from Elm Road to Bamfield Street. If anyone has any photos of this street, I would really like a look. Hi Tony, I don’t have any pics of Buckler St, but I lived for a time in a flat in the three-storey house on the corner of Buckler and Bamfield. I also remember going to Sunday school at the tin hut which was run by Mr Stewart. Behind the house that we lived in was a scrapyard. I think my husband worked with a chap called Clevett on the buses for a while. Interesting for me to see how it used to look. For the last six years I have operated an MOT testing station at Prestwich House, 11 North Street. Whilst excavating to install an inspection pit we uncovered a lot of old boots and shoes! Perhaps there was once a shoe repairer’s shop on this site? I now live at Wolseley Road, near the Stanley. What I wonder is if anyone remembers my grandfather, Bertrum Beagley, who used to live in Albion Street off North Street? I now run the Generator Shop on Shelldale Road, which used to be a car breakers, shoe shop, and mootorcycle mechanics. Any information would be appeciated. Hi David Phillips, yes I do remember you well and my broken leg! Nice to hear from you again – remember your family well. Your mum working in the shop, dad doing the deliveries. We lost Dad about 3 years back but Mum is still alive; 87 now. They were good times, all growing up together. My sister and I still live locally. Send my love to your mum. Best regards. Hi Martha Hooper, I have tried to put detailed comments on this website about North Street and its house numbering [and who lived in each house] as I lived at No. 53 between 1951 and 1969. My mum [Mary] owned the sweet shop. You can find them on a separate page on this website: go to Areas > Portslade > North Street > Memories of North Street 1951-65. If it rings any bells I’d be interested in hearing from you. My name is Pat, and we lived in East Street. I remember Bohannon’s the second hand shop, Silvertorn’s fish shop and the ice cream palour. Every Sunday our family and my nan and aunties would all have an ice cream. I remember the baker’s shop and the grocery shop on the corner of North Street and Station Street. I now live in Australia. Hi Pat, my grandparents lived in East St Place, a small cul de sac off of East Street. My aunt and her family lived in the first house (I think) in East Street – their name was Foss. There was a pub next door, can anybody tell me what it was called? At the end of the War, my father came home on leave and the grown-ups went to that pub. It was the only time I ever saw my mother the worse for drink. Yes, I remember your auntie Mrs Foss. She had two girls and one boy, and they lived in the first house in the street. I can’t remember the name of the pub. We lived in East Street until we were all relocated to Valley Road Mile Oak. My name is Beryl and I lived in East Street with my sister Pat, who is the one who went to Australia. I remember your Auntie Foss. I can’t remember the name of the pub, but I remember going into the jug and bottle part. to get a jug filled for my grandmother. Her name was Parsons. I used to go to St Peter’s school, then Benfield, and last the girls’ school in Mile Oak. The name of the pub at the bottom of East Street Portslade was the Clarendon Arms. I was looking in a book on Portslade and found it. Pat – what was the name of your grandparents who lived in East Street Place? Hello Pat. My grandparents’ name was Goacher, they lived in East Street Place until about 1950. I believe your sister Beryl knew my late sister Peggy Turrell. I remember Peggy mentioning the name. My Foss cousins are Jean, Sheila and Gerald. Thanks for the name of the pub, I’ve been trying to remember it for ages. Hi Pat, thank you for answering my message and I have told my sister Beryl to take a look. Do you mind me asking, is Burtenshaw your married or maiden name, also where do you live now? I live in Australia, Beryl still lives in England and we talk nearly ever day to each other on the net. Thank you for telling me your cousins’ names, we could not remember them. I think your grandparents lived in the third or fourth house in East Street Place. There were the Lanes, Pauls and George families also living there. Hi Pat, my maiden name was Turrell, my gran lived next door to a family called Owen. There were two houses at the top of the road facing down and she lived in the left hand one. We have lived in north Somerset for 10 years and before that we lived in London for 28 years. But we still go to Sussex on occasions as we still have family there. My son has just brought this discussion to my notice. I have an interest in the history of my family (the Andrews), who lived in Portslade and Hove for more than 50 years, finishing around 1950. They ran a newsagent’s and tobacconist’s shop with a lending library. They were in North Street but moved to 81 Boundary Road (near the rail crossing) before 1920. I stayed with them a bit as a child. My Grandfather was Eli but I never met him. Then a son, my uncle Tom, with Aunt Amy, ran the shop. They sold it around 1950 but it still had the name “Andrews” outside into the 1990’s. It has now changed use. My father Philip was the youngest son and a sportsman. He was wounded in World War One. Another uncle, David was killed in Flanders and is remembered on the Portslade war memorial at Easthill Park. I have more information if anyone is interested, or if anyone has anything to help our quest for “Andrews” family data. I came upon this site by accident and was interested to see the Foss Family mentioned. Jean, Sheila and Gerald are also my cousins, through my mother – Winifred Attree (Martin). We lived at 26 Wolseley Road until her death in 1968. Does anyone remember Charlie, Irene and Barry Newman who lived in Camden Street, until they were moved to Drove Crescent? Also, Mrs Baker and her son John, who also lived in Camden Street, next to the Alex. Hi Mike Attree. I remember going to your house as a child, we lived in Crown Rd. I remember your Mum as Winnie Martin, and I think I’m right in saying that you had two sisters, Pauline and Margaret. Does anybody remember many years ago (at least 60) a house in Stanley Rd owned by a Mrs Bowden, who ran a shop in her front room? I remember going up the rough piece of land we called ‘the bumps’, between Crown Rd and Wolsely Rd, to get the shopping. Pat – I definitely remember Mrs Bowden. She used to ride a bicycle with a basket, in which her Pekinese, Tansy, used to ride. There was also a shop on the corner of Jubilee Road, run by a Mr Fossleithner (?) …and what about ‘Ada’s’ in Gardner St.- possibly the oddest shop ever?! You’re correct about my sisters but there was also George, Irene and Eileen. However, they may have left home by then. I was actually born in St Leonards Road not far away. But can anyone tell me the name of the pub that was on the corner of North Street and Middle Street where the Bathroom Shop now is? Also are there any pictures of it? Does anyone remember the baker’s shop on the corner of North Street and Campden Street, owned by my grandad, Ernest Mason? Does anyone remember the Bakers shop on the corner of North Street and Campden Street, owned by my grandad, Ernest Mason? Pat: Yep – that was my Dad. He used to drive the Number 6 bus from Brighton station to Fishersgate. At the rear of Buckler Street was a saw mill owned by Len Ratcliff. We used to play in the alley there. Looking at it now, it seems so small. The ‘ice Cream’ shop towards the south end of Station/Boundary Road in Portslade – does anyone know the receipe of the fantastic homemade vanilla flavour that the man used to make? He was bald and I remember quite frail but was always happy and whispered when he spoke. I believe he passed away in the early 1990s I think? The shop was then reopened by different owners and was never quite the same. It shut about one year later. Would love to try to recreate this ice cream at home – mmmm! Mike (Attree): I remember Mrs Baker and John her son with whom I went to school. (See photos in the school section of this site for St Peter’s School Portslade, Benfield & Portslade County School for Boys). Mrs Baker and John later moved to Valley Road in Mile Oak. He and I used to go back to his house there sometimes for our lunch when we were at Portslade County School. I bumped into John one Sunday lunchtime about 15 years ago in the Castle Hotel in Bramber. The next Sunday he brought his Mum to see mine (Kitty Phillips, nee Smith), as the two had known each other quite well before and after the War. I seem to remember that John was in the swimming pool business at the time but I haven’t seen him since. Alan (Phillips): John Baker has been living in Spain for some years now. When I last had any contact with him, he was doing general maintenance for the ex-pat community. Dave (Phillips): That would be the same family, although they lived at no. 51 – so you would have been in the upstairs flat at no. 49. They always kept Alsatians. I am looking for any information on a Frances Charlotte Morley. She lived in Woburn Place and had a son called John Henry Morley who is my father. If anyone knows of this family, I would be interested. Hi Mike, with reference the Newmans. I definitely lived at 39 Drove Crescent and these Newmans were definitely in the flat below so I guess that they must have been a different family. I do not remember any Alsations either. Ahh well! Jork Andrews: I think most of us that went to Benfield School would remember Andrews shop. We would go there after school to buy penny drinks from old Mr. Andrews who was a lovely, kind gentleman who knew most of us by name. After he passed away his son did take over the shop. I remember how alike they looked. The shop is still there, but no longer a sweet shop. I am looking for anyone with any information on a John Henry Morley. He lived in Ellen Street with his mother, Frances. He married my mother, Eleanor Morley, who lived in East Street in the 1930s. I would be grateful if anyone knows any of these people. I too was an Andrews customer. Four chews for a penny on the way home from Benfield – through the cattle arch and on to St Andrews Road….. Oh what memories. Jim Stocks and I were arrested on the Hove seafront scooting our bikes. The policeman walked us from the Lagoon to St Andrews Road Police Station where we were lectured and then he walked us home and our fathers were also lectured about our total lack of respect for the law. We both got a good telling off for that one. We were 11 years old. I think we also had to go and sit in the police station on that Saturday morning to see the Senior Seargent. Don’t times change! My Grandmother lived at 44 North Street until her death in 1965. I think she moved there in the 1950s. I visited with my parents occasionally and spend summer holidays there in the late 1950s and early 1960s. My memories are scant but I recall that 44 was an upstairs maisonette. I have a photograph of her unlocking the door and there seems to be a shop window next door as there is a Bachelors Peas sign running along the bottom of the window. I do not recall the shop but remember a café on the same side a few doors up. Thanks for the posting. Spent a nostalgic day in Brighton this week including a visit to North Street Portslade and your information, plus the photograph, are of great interest in my family history work. Does anyone remember Marions Wool Shop in the Old Village, it was run for a time by my parents Reg & Nan Monington? I also have a photograph of the football team from St Andrews School with a large trophy dated 1924 has anyone any recollections of this school. With regard to Barry Newman, he did live in a flat in Drove Road and his family kept white alsatians. He lived in South Street in the Old Village with his wife Rita and 2 alsatians for around 30 years. He passed away around 8 to 10 years ago. My brother David and I lived in Lincoln Road from 1943 to 1966 and went to St Peters, Benfied and Portslade boys. I remember the Albion cinema at the bottom of North Street, a real flea pit! I moved to Romsey Hampshire in 1969 and still live here. I do remember the wool shop in the old village. I used to knit my childrens’ clothes and bought a lot of wool there. In the 60s it was owned by a Mr Button who was an inspector on the buses, I believe his wife ran the shop. Marion, I think you were in the same class as me at Mile Oak Girls School, my name was Pat Turrell. Marion, my husband has suggested that Buttons was a nickname because the shop sold these, so perhaps it was your father that owned the shop at that time. Hi, has anybody got any information about St Aubyns Road/Norway Street? Apparently no 35 St Aubyns Road, Portslade, used to be called 48 Norway Street, and what is now 48 Norway Street, used to be a private dance school. I am looking for any information of all my school mates that lived in Wolseley and Stanley Road: Peter Scott, Stella and Harold Loew, David (Friday) Lyles, Andy Mallet and the Oakles. And in Stanley Road: John and Billy Cockings. I also remember Mrs Bowden behind the air raid shelter. Hi Allan, yes I remember them all, Frank Hobden too. I have not seen you for years. I remember the Bowdens well and the shop, old Fred Steele, the shoe repairers at the top of Wolseley Road, owned by Max Miller’s brother. Before that it was Miss Katt’s sweet shop. What about old ‘Cough Drops’ cycle shop at Southern Cross? Hi Pete, my sister Judy still lives in Southwick, up Overhill. Thinking about shops, what about Ada Parrinder’s shop in Gardener Steet. It must still stink of parafin. Nice to hear from you. I have found this site for the first time and read the wonderful nostalgia around North Street. Sadly, my input will not trigger many memories but you may like to feel some earlier family history. I was prompted to write, having seen the photo of North Street at the turn of the century, the time when my family had a greengrocers and fruiterers at No 65. It may possibly be somewhere in the photo. I believe it is now a bathroom centre. If there are any other photos of the shops, I would love to see them. The shop was owned by Albert March jnr., who married Priscilla Richardson of 2 Station Road in 1896 at St Andrews Church Portslade. He was the eldest of 12 children and his sister Marie also worked/lived in the shop and was still there when she married a widower Richard Russell of Southwick in 1902. They emigrated to Kansas City in 1910, strangely leaving a son of 8, Reginald, behind to live with the grandparents in Bampfield Street (according to a glimpse of the 1911 census). They were never heard of again and I’m still searching. Albert jnr. died young in 1920 and I would like to know if the shop continued in the name of March (wrongly listed sometimes as Marsh). He also had a shop in Shoreham at 11 East Street. The March family were from Bampfield Street. The parents Albert Snr, originally from Thakeham, married Maria in 1873 at St Nicholas Church. She was from Malaga Spain where Albert had been living, building a villa for her father. Bampfield Street was originally recorded in 1881 as Petersfield Terrace when they lived there. In 1891 their address become 4 Bampfield and by 1901 had changed to No 7, still the same shop/home. Maria never spoke English and she sold Spanish home made ice cream and tobacco from the shop, plus a bit of fruit and veg from their market garden. Albert Snr. was a master bricklayer and steeplejack. It was he who built the tall chimney stack at Portslade Power Station that could be seen for miles from across the Downs and coast. How I would have loved the top brick of the chimney when they demolished it a few years ago. Another great well known family in the area were the Gobles. They ran the pub on the corner of Bampfield back then, they were competitor greengrocers, they were often next door neighbours to March offspring, some lived in Bampfield at the same time, the great grandfather put the scaffold up for Albert’s chimney and the present owners of the old family home are, you’ve guessed it, the Gobles. Life had been tough for Maria, fleeing Spain during some uprising, witnessing members of her family being murdered when Albert was there. Two daughters had emigrated the same month in 1910, Marie to America and Harriet to Australia, both never to return. Whilst the troops were stationed at the new barracks down the road, she would serve them with their tobacco. It was behind the counter my Grandmother Constance flirted with Welshman David Morris, who was to become my Grandfather. During the last months of WW1 in 1918, two of the four sons Charles and Sidney were killed. Charles was a furniture dealer in Portslade and was sent home from France, dying of his wounds and pneumonia in the Bampfield home. There was a large military funeral procession up Trafalgar Road to Portslade cemetery. His Widow Lydia and child Lydia Maria returned to her family in Hampshire. Sidney had no time to marry and is buried in Rouen. Since 2006 there is a Memorial plaque, aptly at St.Nicholas, for the March brothers, along with 89 fellow men from Portslade. Their sister and my Grandmother Constance married David Morris at St. Nicholas in 1919. Probably the first time Welsh Hymns and Welsh was heard in the church. All just in time as in 1920 Albert Jnr died, followed by Albert Snr in 1921. There are no surviving descendants of Albert and Maria, carrying the March name, however, there were many daughters. If anyone can relate in anyway to this family, please make yourself known. I have found an unmarked grave for Albert, opposite Charles grave in Portslade Cemetry. Noone can confirm if it was Snr. or Jnr. as they died within a year of each other. Maria died in Lancing in 1933, but sadly, I have never found her grave. I appreciate this site is for North Street, but does anyone have any early photos of Bampfield? I do have the original photo by HW Tubbs of Portslade of the entire March family in 1910, the only and last time they were together. I could post on the site if there was a request. My husband found out his father’s name is Barry Newman when his mother died and he found her diaries. He has never met him except once when very young. He was born in 1973 but the diaries showed Barry visiting his sick mother in Brighton around 1972/73 and that Barry had a sister. We found a newspaper clipping only showing a photo of a man clearly his father due to one eye distinctively slightly higher than the other – in the early 70’s Barry had thick black wavy hair and I think worked in a trade for Babcock & Brown in London where he met Rob’s Mum. He would have been born around the 30’s or 40’s. I am wondering if this could be the Barry Newman mentioned above and in a comment last year showed him as passed away. Can anybody help? Barry Newman was my nephew, born in 1947, and the only child of Irene and Charles Newman. He never had any children. On the earlier article regarding Ada Parrinder, I am always reminded of the couple in ‘The League of Gentlemen’ and the fact that they only seemed to stock potatoes. I am currently researching my family tree and am after any information anyone can give me regarding my late father, Desmond Ian Turrell. He was born in Brighton and we do know that he had a sister called Patricia. We were wondering if this is the same Pat Burtenshaw from this site? Any info from anyone would be appreciated. I am sorry Valmai, I am not the Pat Turrell related to you. There are a lot of Turrells in the Portslade and Shoreham areas, but I have never heard of a Desmond. Hello, anyone out there? I wrote what I thought was an interesting article last January. Has Brighton gone asleep? Almost 9 months since the last comments. I’m doing my family history and have found that a relative of mine - Charles Herbert Blundell – lived in St Aubyns Road, Portslade, and wondered if any relatives of his still live there, or anybody that knew him. Hi, I found this page by accident. My ancestors lived in Camden House on the corner of North St and West Street and I was wondering if the original house is still there. In 1871 James Holes and his family lived there as well as Thomas Olliver and his family. I have a copy of a photo taken at the rear of the buiding approx 1870. James Holes moved to 21 George St in c1881. My father Peter Scott lived at Wosley Road as he grew up and I used to visit that house in the sixties to visit my grandad called Bert. It was the 2nd house on the same side of the Stanley Arms next to the house that was painted green. It was very interesting reading about people who once lived there. Peter Scott is my father. To this day I still miss my grandfather Bert, does anyone know him. Hi, it’s Melvyn again. I can now remember the house number – its 51 Wolsley Road and my Nan’s name was Anny Steele, Married to Bert. Bert and Anny Scott, Peter Scott’s parents. I may have missed it but there is no mention of the Pavilion Cinema in North Street. I spent many a Saturday morning in there as a boy. There is a short view of it in the film “Battle of the V1” where it was used in a scene as a meeting place for the underground (French resistance), after it was no longer used as a cinema. Hi Mag, re Charles Herbert Blundell of St Albyns Road, Portslade. He was my father. What is your name? Would be interesting to know more about family history. Brian Blundell. To Terry Morris (08/01/2009) I am the grand daughter of Lydia March, daughter of Lydia and Charles March. Charles March (My Great, Great Grandfather) was the one that died in 1918 of war wounds. Get in touch with me. jimandlynmobley@yahoo.com Can’t wait – So excited. Hi, I am trying to trace the Gander family who lived in East Street around the time of WW1. My other half is decended from them. Interestingly looking at the names above, Leonard G married Daisy Florence Burtenshaw. 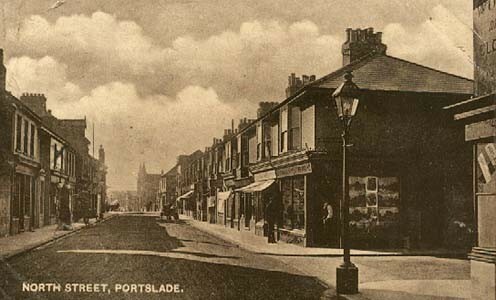 Can anyone tell me the name of the pub that used to be on the corner of North Street & Middle Street in Portslade? There were three pubs in North Street that I remember. The Clarendon on the corner of East Street and the Clarence or Monty’s opposite West Street is probably the one. Hi Brian and Mag, my great grandfather was a Charles Blundell and lived in Hendon Street – at the back of Brighton College. I know there are other Blundells around Brighton – are we all related? Hi David, most probably not recent relations. My grandfather was born in London and moved down around the 1920s. I used to think the same whenever I saw a Blundells removal van. I am trying to find out information about my mother’s family who lived at no 3 Bampfield St from the early 1900s until around the 1930s. My grandmother was called Clara Or Claire Lillian Ferris born in 1904. My mother’s grandfather was John Amos Ferris a shopkeeper/hairdresser. My mother was born in Rustington in 1929 and adopted out. There is no record of her father. However her mother married William Edward Richardson of Winchester St Brighton in 1938. Does anyone have any information to share on these people? Pikes Directory 1937/38 still has John Amos Ferris at that address. My great grandfather Charles Salcombe owned The Clarendon Arms in North Street. I’ve just found an old photo of the pub. I’ve just seen mention by Nicolas Reah of Norway Street in Portslade. My mother and her family lived in Norway Street shortly after World War I until about 1963. George and Florence Francis were her parents. Florence died in 1936, leaving George with three daughters – Hilda (born approx. 1916), Irene (born 1919) and my mum Mabel – known as Maisie, born 1925. The family was affected by the smallpox outbreak which I believed happened in the mid 20th century. Irene was struck down but recovered and lived in Portslade for the rest of her life, until 2006. My mum Maisie moved to London during the war and is still going strong at 91. Any memories of Norway Street or the Francis family would be lovely.